This entry was posted on February 24, 2016 at 1:24 pm and is filed under Biography, Comedy, Drama. You can follow any responses to this entry through the RSS 2.0 feed. You can leave a response, or trackback from your own site. Good to read. Couldn’t get excited for it but now I find myself a little more optimistic. It was the cast that sold me. Sounds like quite an inspiring and funny movie. Yes I’m in the UK, I can’t understand not releasing it here at the same time as in the US. Yet to see this but after his performance in Kingsman Edgerton’s got my intrigued! It’ll be nice to see Jackman in what looks like a Wolverine-lite angsty role. Great work. This is Hugh Jackman in “acting” mode. Remember Prisoners? He was great in that too although the two movies couldn’t be more different in mood. Yeah, he is really good in Prisoners. Glad to hear it! “YES” to everything you just said. I’m looking forward to seeing what Taron Egerton does next. A little cornball, but sweet nonetheless. Yeah I wasn’t a huge fan of Kingsman. I recently rented Testament of Youth. Apparently it was released in the US in June of 2015. I don’t even recall it in theaters. Anyway Egerton has a small part but Alicia Vikander starred in it too and I had to see a movie that featured both of them. It’s just alright, by the way, not spectacular. 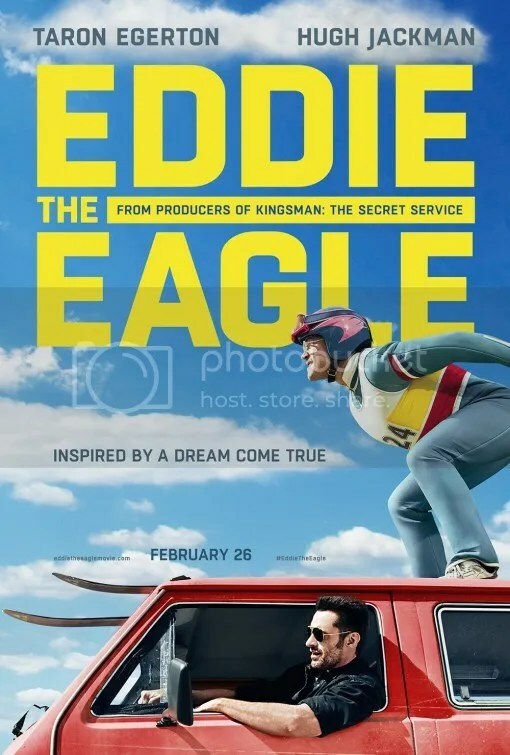 I had never heard of Eddie the Eagle, but based on the trailers I assumed this was a typical sports underdog tale. Hence why I didn’t bother with it. Sounds like I wasn’t too far off based on your review. Although admittedly I would like the Hall & Oates training sequence. I haven’t seen Egerton in anything yet, but I’ve heard he’s definitely someone to watch. Maybe I should go back and check out Kingsman or Legend. Apparently “Eddie the Eagle” was rather well known in Great Britain. At least in 1988 anyway. It’s not necessary to know who he is to appreciate this though. I didn’t and I enjoyed it.